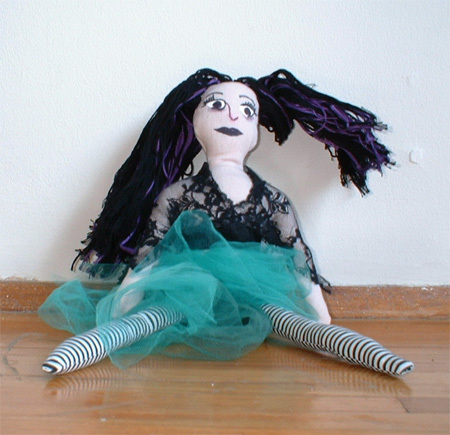 I sent these out for a swap (Voodoo Hoodoo Creepy Cute Dolls). 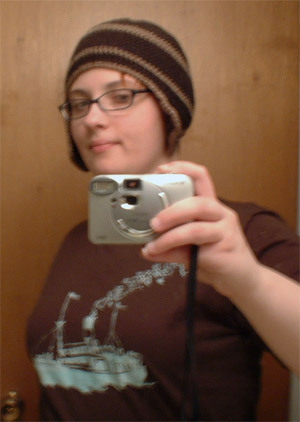 This one was for teddybearbones, and is sort of Tim Burton-esque. 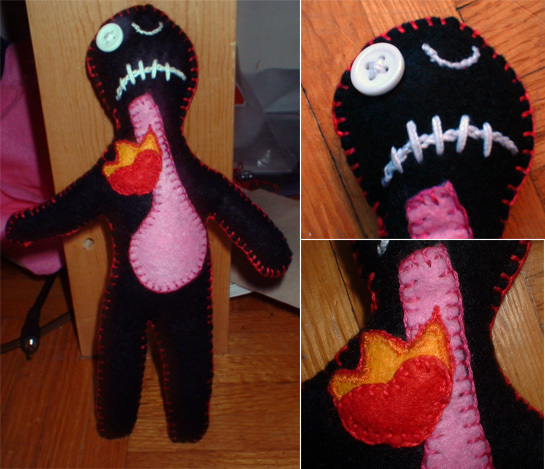 This one was for stopmoshun, and she said that she hated indigestion, so I made her a Tummy Ache Voodoo Doll. He has heartburn so that you don't have to! I'd like to thank both of my partners for inspiring me to try my hand at making dolls again! 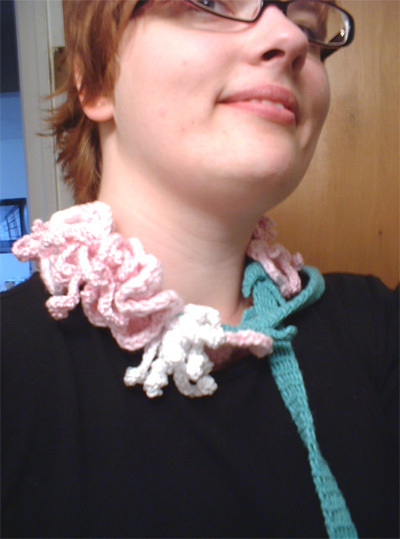 I crocheted this for a swap, based on the Anthropologie Hidden Vines Scarf from their catalog last summer. 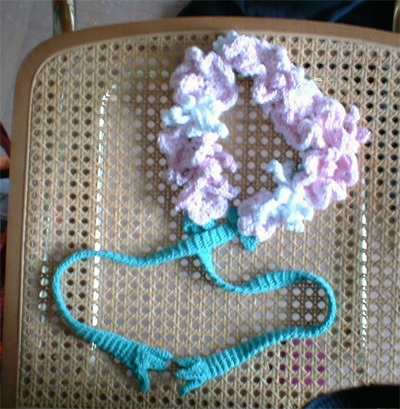 The recipient likes cherry blossoms, so I made the flowers pink instead. 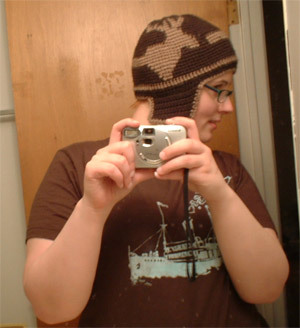 This is made from various bits of cotton I had lying around, so it would be light enough to wear on a chilly morning this season. I didn't end up making very many leaves, because the green is a thin thread and I didn't have the patience to make large leaves. When I tried to, they looked kind of awkward because they were made of too many stitches. Since the sad demise of Lewiscraft, I've been feeling bereft. Do any of you lovely craftsters know of a general variety craft store in Vancouver or Burnaby? I'd prefer to not have to cross the Lions Gate or bus to Richmond to pay a visit to Michaels. Some of the things I miss from Lewiscraft include: silver findings for jewelry (especially clasps and pinbacks), the wide spectrum of colours of Lily Sugar and Cream yarn, and tatting supplies (Michaels doesn't carry anything for shuttle or needle tatting, and the sales associates had no clue what I was talking about). If anyone knows of any stores that carry these things, I'd be extremely grateful! Bonus points if anyone can point me in the direction of Crafters' Goop or E6000! This hat is a gift for my partner. He asked for a hat for his birthday. 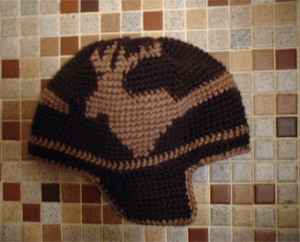 When I asked him what he wanted it to be like, he specified brown, with earflaps, stripes, and a moose. If I were to make a moose again, I'd chart it out to have a bigger snout because I think it looks too thin to be moose-y. I guess random antlered animal will have to do. The flaps look a little long, but it works out because his head and face are bigger than mine. Made with Patons Shetland Chunky in Deep Taupe and Earthy Brown with a 6 mm hook.